Two winners of the Fiji Human Resource Institute Awards will get a chance to attend the prestigious Australian Human Resource Institute National Convention this August. 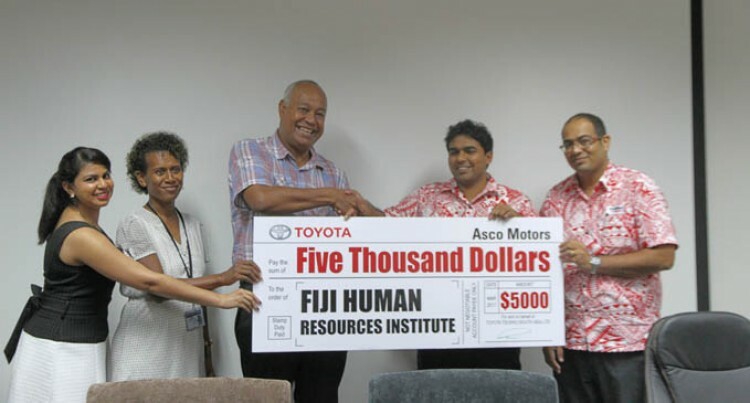 President of the Fiji Human Resources Institute (FHRI) Kameli Batiweti made the announcement during Asco Motors sponsorship announcement for the upcoming Fiji Human Resources Institute Awards yesterday. “It costs a lot of money for a Fijian to fly all the way to Sydney and costs a lot more money to attend the HRI Convention. It will be a great opportunity for the two winners to go,” said Mr Batiweti. An award will be presented to a Young HR Practitioner and Senior HR Practitioner. The Awards will be held on the 27th of May at the Suva Holiday Inn. Submissions on applications for nominations will close on the 18th of this month. Mr Batiweti said without the Asco Motors sponsorship, it would be impossible for FHRI to handle the awards on its own. “A lot of organisations look at sales, finance and all that while Asco Motors, being a leader in human capital investment have invested heavily on their people. People make the money. “If you invest heavily on the people then the people will turn it around for your appropriately but if you invest in other places then you will reap the harvest from those kind of investments,” said Mr Batiweti. Three days ago, Asco Motors had handed over a cheque to the Fiji Commerce and Employers Federation to support the upcoming Top Executive Conference at the Shangri La’s Fijian Resort and Spa from the 23rd to 24th of June. “That speaks volumes of their attitude towards investing in human capital and that is excellent because times are hard and there are a very few companies investing in human capital and Asco Motors has taken the lead in that respect to come forward now,” said Mr Batiweti. He acknowledges the Federation’s other sponsor BSP Life and Finance and BSP Bank who have been with them for three years. Chief Executive Officer of Asco Motors, Craig Sims and Human Resources Manager, Avnit Sundar were more than happy to present the $5000 cheque to FHRI on behalf of the Asco Motors team. “The importance of Human Resource cannot be understated. We are pleased to get behind the event this year to recognise all the people who put in a lot of hard work and effort to retain, motivate and keep our employees engaged,” said Mr Sims. Mr Sims believes that all companies have a mission and a vision. “Our vision is to be a great company. But in terms of what our core beliefs are, it is really happy people and great quality products equals a successful business,” said Mr Sims. Great service can only be given if there is a happy and well engaged environment for the employees, he said.